In the last issue of Global Asia, our cover package on “Trump in Asia” pointed to anxieties about the direction of US policy in the region, in particular the war of words between Kim Jong Un in North Korea and Donald Trump in the US, which many feared could inadvertently lead to war. As the current issue was about to go to press, Trump stunned the world by instantly accepting an invitation to meet Kim delivered on March 8 by a high-level delegation of South Korean officials. That meeting is currently set for May. As improbable as it seemed only a few months ago, there is now hope, however cautious and guarded, that this could begin a path to denuclearization and peace on the Korean Peninsula, potentially removing one of Northeast Asia’s greatest threats to stability. But it is a long shot, and the path is likely to be strewn with many obstacles. Moreover, the Korean Peninsula is only one of many potential points of conflict in Asia. Maritime and territorial disputes litter the region and divide countries large and small, some fueled by lingering historical grievances: Taiwan remains divided from mainland China, with the prospect of forced reunification still on the table; India and Pakistan, both nuclear powers, remain mired in mutual distrust; and a rising China, led by a president who on March 11 — in another momentous recent surprise — received constitutional authority to remain in power indefinitely, is showing an increasing willingness to assert its growing power throughout the region, putting it on a path of potential conflict with the US in Asia. 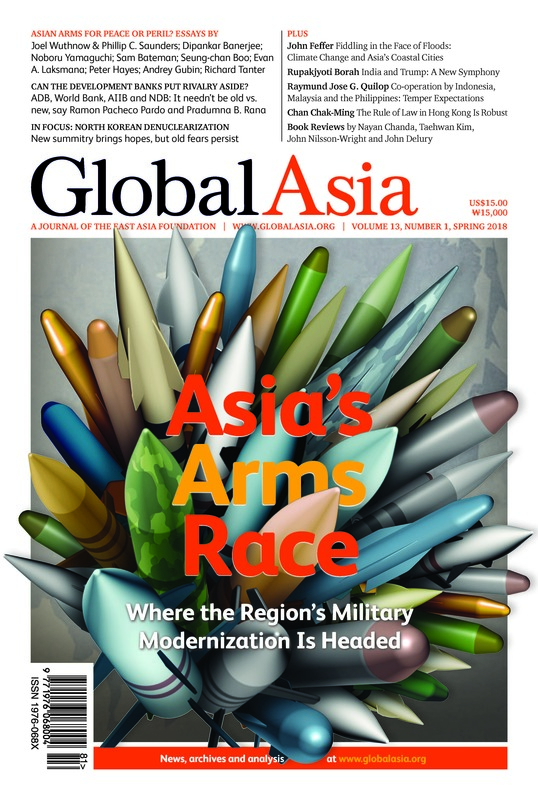 In our cover package, we examine how these multiple security concerns underpin a region-wide push to modernize militaries to prepare for possible contingencies and lay the groundwork for an arms race in Asia. Under the guest editorship of Peter Hayes, a member of our Editorial Board, we examine what is taking place around the region to enhance military capabilities, and the strategic rationale of the governments concerned. To be sure, military modernization can be an instrument to ensure stability and avoid conflict in a troubled world, but it can also be a wellspring of tension and conflict if threat perceptions arising from those efforts aren’t properly managed. In our Features section, we look at how co-operation between traditional multilateral development lenders such as the World Bank and the Asian Development Bank and the newly created development banks led by China is emerging and how it could provide a boost to a region in desperate need of better infrastructure funding; at efforts by Indonesia, Malaysia and the Philippines to forge a trilateral relationship to resolve common security problems; at how India and the US are deepening their bilateral relationship under Trump; how Asia’s coastal cities are courting disaster by ignoring the need to prepare for rising sea levels now, in the face of climate change; and whether the rule of law in Hong Kong is being undermined by Beijing, as some legal observers in the autonomous region argue, given a number of recent incidents. In our In Focus section, we look at the possibility of denuclearization on the Korean Peninsula, especially in the context of the diplomatic initiatives surrounding the PyeongChang Olympics. Finally, as always, we feature reviews of some of the most intriguing books on Asia. While East Asia has stood out in recent history for its exceptional 70-year period of peace, it would be wrong to assume that policymakers in the region aren’t worried about, or aren’t gearing up for, future conflict. Numerous potential flash points exist, from the Korean Peninsula, the Taiwan Strait, the East and South China Seas, and South Asia. Those worries are fueling Asia’s push to modernize their military forces, thus risking an arms race. Introduction: A Path to Peace or a Looming Peril? Numerous potential flash points are fueling Asia’s push to modernize their military forces, thus risking an arms race. Expansion has big implications for China’s neighbors, the US and the rest of the world. How the nation has been forced to respond to the pressure for military modernization. Under Shinzo Abe, great strides have been made in the country’s ability to respond. The US retains naval hardware superiority on the seas, but the Navy must urgently learn from recent accidents and mishaps. Seoul’s security fears as the stakes are raised ever higher have prompted it to pour resources into arms. A close analysis of the patterns of spending and their development over the years. An increasing number of states in the region are building their own submarine military presence. A build-up in Russia’s military capabilities includes a revival of the previously neglected Russian Pacific Fleet. How the country’s dependence on its alliance relationships helps determine the direction of its arms modernization. The AIIB’s and NDB’s focus on infrastructure financing in developing Asia is welcome. Without more action, many urban areas in the path of rising sea levels will be flooded. The only question is when. Despite wariness of the Trump administration, New Delhi and Washington are growing closer. The strategic implications are significant for the Indo-Pacific region. These efforts focused on counter-terrorism have yet to be fully operationalized. Political debate in Hong Kong has increasingly included expressions of fear that legal certainty is being eroded. These fears are misplaced. A possible future on the Korean Peninsula of peace and mutual prosperity is visible now, but it will take much hard work yet to get there. A recent Chatham House conference on North Korea evinced some pessimism that remains valid despite upcoming summits. A gathering in Seoul in December offered pointers for the issues that will remain to be solved after the Trump-Kim meet. Concerns for a just world pervade Gareth Evans’s Incorrigible Optimist: A Political Memoir. New titles by Peter Hayes and Chung-in Moon (eds. ); Kevin P. Clements (ed. ); Alyssa Ayres; Ian Johnson; Charles R. Kim; Max Boot; Rodric Braithwaite; Walter C. Clemens Jr.; S.C.M. Paine; Andray Abrahamian; Will Doig.